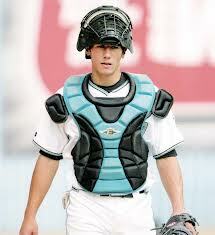 Catcher Tucker Frawley joined the Toronto Blue Jays’ organization after being drafted in the 8th round of the 2012 MLB Draft out of Coastal Carolina University, a time Frawley discussed as being exciting and memorable. “Going into the draft, I tried to not set any real expectations as to where or when I would be drafted. Because I was a senior, I just wanted an opportunity to continue playing, so when the Blue Jays drafted me where they did, I was obviously extremely excited to get the chance to keep playing the game that I love,” Frawley stated. The 23-year old continued playing the game he loves, making his professional season debut with the Vancouver Canadians maintaining a .185 batting average on the season, while hitting 15 hits in 26 games. Frawley stated this opportunity went well and was beneficial to his development. “Obviously I did not perform offensively like I would have liked, but I gained valuable experience and learned a lot about professional baseball over the course of the season. The team was full of great guys and the coaches up there really taught me a lot,” he said. Despite not having the rapping talents, Frawley has many skills. He personally admits that one of his best strengths is his ability to learn new things, something that was hugely important after taking the jump to professional baseball from college ball. 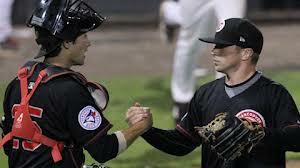 Frawley states that as a catcher he was able to make great relationships with both position players and pitchers. He is pictured above with RHP Arik Sikula (MiLB.com). Frawley further discussed his time in university. “The time that I spent at Coastal Carolina for five years was something that I will cherish forever and would not trade for anything. I received a great education and made some very good friends while getting a chance to be a part of a team that had a chance to compete for the national championship each year. The coaching staff there was second to none and really helped me develop and become a better player. I was extremely fortunate to get a great academic experience in addition to on the baseball field,” he said. He added, “My academic advisor and professors were great and helped me to succeed in the classroom. If baseball did not work out, I was planning on taking the MCAT and applying to medical school. Analyzing his college performance, the Blue Jays’ organization should be fortunate that Frawley chose a career in baseball rather than medicine as when he wasn’t finding success in the classroom, he was finding success both behind the plate and at the plate, being named a semi-finalist for the nation’s top catcher in his senior year after maintaining a .296 batting average, .411 on base percentage while scoring 25 runs and hitting eight doubles. But as aforementioned, Frawley not only has offensive abilities, but strong defensive talents as well. Throughout his time at Coastal University, the prospect threw out 49 percent of base runners during his senior year while committing only nine errors in 854 chances in his entire career. In closing, Frawley stated that amidst all of his many talents and accomplishments, the one thing that gives him the most pride is his background and family. “Many people do not know that I am one-quarter Japanese. I have a Japanese flag on my catcher’s mitt and many teammates do not even know until they ask about the flag. My grandmother was Japanese, and it is something that I am always proud of,” he said.